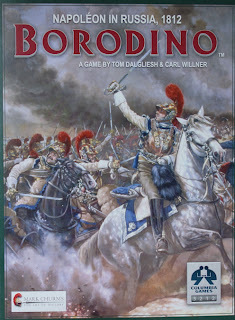 Last night, we played a face to face game of Columbia Games' Borodino and it was interesting to see that even within the constraints of this head on clash, the game opened up and played out in a slightly different way than my previous solitaire game and was an exciting challenge for both players, who both felt fully engaged throughout play. 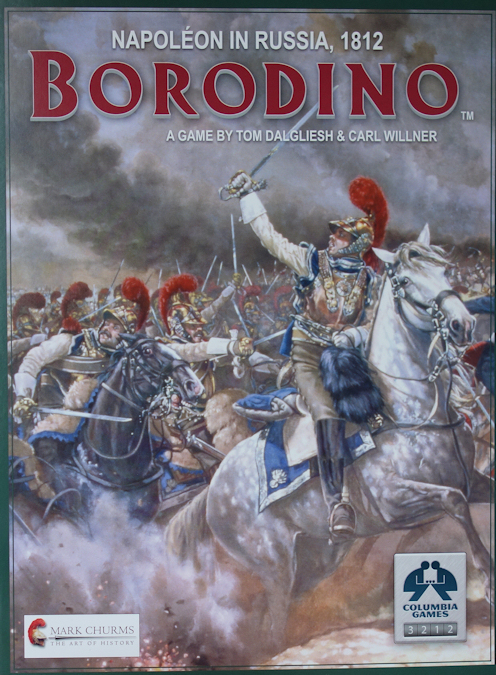 For a detailed post about the mechanics of the game, please select the post called 'Borodnio - Napoleon in Russia 1812' from the Borodino labels section over on the right (at the moment, it should be the follow on post from this). I took the Russians and Mike took the French, I just wanted to see how another player might handle the French compared to my attempts in my recent solitaire game. 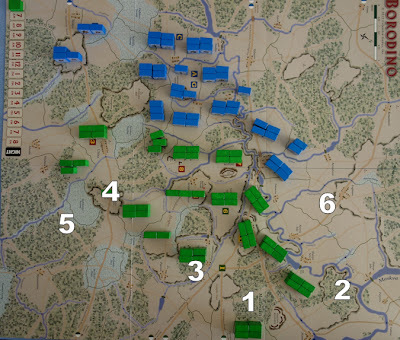 1/ The Russian Cossacks move firstly to position 2, to cover the river as French 4th Corp starts to move up that wing and then mid game, when that threat recedes, they moved over to position 3 as a central reserve, as other points of crisis became obvious. 2/ By the halfway point, it looked like the French were putting all their energy (supply points) into developing an attack on the other flank, so the Cossacks were able to abandon this part of the line, as they were needed elsewhere. 3/ This is where the Cossacks ended up as a central reserve, as all other units became engaged or destroyed. It is also the starting point of the powerful Russian Guards unit and excellent artillery. 4/ As the French right flank developed a strong attacking force, which I suspected included the French Guard, I moved my own guard unit and powerful artillery onto the hill at position 4. This is a superb defensive position. I hoped that the French would assault it and get a bloodied nose, as the French Guard are powerful but brittle and that might put them out of action for the remainder of the game. 5/ The French had pushed their flank into this position, so that the hill (4) could be assaulted from several directions. However 2 turns of fire from my powerful artillery on the hill destroyed his lead formation of 3 units (at 5) and this had the effect of causing the French not only to pull back on that side of the field but to think twice about assaulting the hill. By this stage of the game, it was too late for the French to re-direct their efforts to other parts of the battlefield. 6/ This is the furthest that French 4th Corps moved to, choosing instead to spend their supply on their centre and right flank. This allowed the Russian Cossacks to redeploy and become a critical reserve. They were able to use the interior road network to good effect (move 3 areas per turn). Overall the game was tense with the French looking for every opportunity to break through and the Russians plugging the gaps as they appeared. At one stage I had a single force in the centre and that looked like the part of the line that would most likely fail, but I drew breath as the French gave me a one turn opportunity to bring other forces (the Cossacks) into the area, perhaps they did not have the command ability in that area to push there at that time. Although I 'held the line', the game ended with a deserved French victory based upon the casualty rate and 'occupation' of redoubts. The whole scenario was played out in under 3 hours, including French set-up and a brief explanation of rules etc. I enjoyed the face to face aspect because of the fog of war element that the blocks bring. It was also interesting to see how Mike saw the right flank as a place of opportunity, while in my solitaire game, I felt the French right too weak to really exploit that part of the field. It is always a pleasure to see how a different mind can bring something new to a game that you have previously solitaired and blow apart any preconceptions of play / strategy. I am looking forward now to playing the three day battle. [French perspective] : it seemed that I needed to extend the left flank to give the opportunity for more of my troops to have the chance for action and that a straight frontal assault would be inadequate. With the space created I also started to move my cavalry corps centre and left, accompanied by tentative artillery fire in the centre. Soon, however, I began to feel that this was a wasted line of action, as I couldn’t see how I could concentrate enough strength on the left flank to force a significant crossing of the river. I then focused on attacking in the centre while shifting troops, including the Guards toward and round the Russian left flank. Fighting in the centre was particularly bloody and I was eventually able to take Les Fleches and be significantly ahead in eliminating more units. Fortunately, Russian artillery, focussed on Les Fleches, repeatedly failed to score more than a single step loss per turn, both taking up valuable command points and allowing me to replace the loss each turn. Undoubtedly intercepting French couriers, the Russian generals had done a good job of anticipating my plans and I was horrified to see most of my intended enveloping forces wiped out by two turns of devastating artillery fire. Obviously these were of considerably different quality to the Russian artillery in the centre. Consequently the final stages of the battle largely involved my ensuring that no further losses were incurred by these troops and trying to eliminate a few more Russians by my artillery fire. Much to my surprise, the losses I had inflicted and the terrain I held were sufficient to gain a French victory! Vive la France! Vive le Petit Caporal!